Facebook Gifts: How the social network has revolutionized gift-giving on the Web. 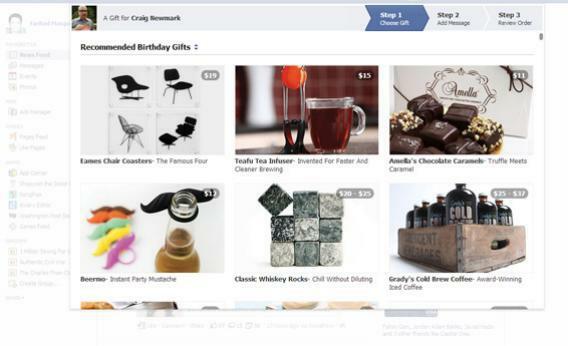 How Facebook has revolutionized gift-giving on the Web. The Web is terrible at offering gift advice. Consider this scenario: It’s your sister-in-law’s birthday in a couple of days. She’s one of those super people who’s always sending you gifts and cards. Wouldn’t it be nice to get her something nice, too? Notice that none of this is quite the Web’s fault. It’s better to call it a first-world social problem—the problem of giving nice gifts in a society where people are far-flung and loosely connected. But this is a problem that the Web, which exists to both sell things and connect people, should have solved long ago. Yet gift-giving has improved very little in the Web era. Amazon’s Wish Lists, which were launched in 1999, are the biggest innovation I can think of, but they’re only useful if your giftee is an Amazon shopper who maintains a list, which is a rare combination. The other major recent innovation is electronic gift cards, which are basically just another way to give cash. Earlier this year, though, a startup called Karma launched a mobile app that I considered a breakthrough for gifting. The app alerted you to your friends’ special occasions, recommended gifts they might like, took care of all the pesky gifting logistics, and, best of all, gave the giftee a sense of joy even before the thing arrived. Karma did a lot of this by plugging into the world’s most-comprehensive repository of social relationships—Facebook. It wasn’t much of a surprise, then, when Facebook announced that it had acquired the small firm last spring. The Karma team began working at Facebook on May 18, 2012—which happened to be the day that Facebook’s stock went public. Lee Linden, Karma’s 30-year-old co-founder, told me that the group skipped Facebook Bootcamp, a six-week orientation program that new engineers at the firm take to get up to speed with Facebook’s technology. Instead, they got right to work on a new service, called Facebook Gifts, which is a version of Karma that’s built into Facebook’s mobile and desktop sites. That service launched in September, and it’s slowly rolling out to Facebook’s users. (At the moment, a mere “tens of millions of people” have access, Linden says.) Facebook Gifts is a work in progress, but in my experience, it’s the best way to give gifts on the Web today. It’s also a perfect synthesis of Facebook’s grander business aims—to combine social relationships and commerce in a way that’s profitable for the company and not annoying for users. It has the potential to become something more, too: a solution to the world’s gifting woes, a way to quickly, easily, and thoughtfully make the people around you feel like you care. Last week, I bought a gift for my wife using the service. I cajoled her into buying me one, too, so that I could experience Facebook Gifts from both sides of the transaction. I found the whole thing fantastically easy. More than that, though, it felt special—even though the situation was self-engineered, when I got the gift in the mail yesterday, I felt like my wife had put a lot of thought into the process. If you have access to Gifts, you’ll see small links for it all over Facebook—for instance, under announcements of your friend’s birthday, you can click, “Give him a gift.” You can also just go to anyone’s page and click the gift button. Do that and you’ll see a pop-up menu of potential presents for your giftee. Facebook has signed up more than 200 large and small merchants to source its gifts. They range from the generic (Starbucks and iTunes gift cards) to the helpful (a ride in an Uber cab) to the artisanal (my wife bought me Grady’s Cold Brew iced-coffee concentrate, made by a small Brooklyn firm) to the quirky (a kitchen apron you can doodle on). Gifts range from $5 all the way to hundreds, not including shipping and tax. The service recommends a handful of gifts that your recipient might like, but it also lets you choose anything from its catalog. Choose something, pick a digital greeting card to go along with your gift, and then add a nice note. If you’ve never given a gift on Facebook before, you’ve got to enter your payment details, too. You can also decide whether or not you’d like your gift to be announced on your recipient’s Facebook Timeline. Then press send. But the digital greeting card that comes along with a Facebook Gift is different. Because it carries news of an impending real-life gift, the card feels special and substantial. Yes, the gift might arrive a few days after your birthday, but at least you know that your pal is thinking about you right this minute. You feel a connection across space, and it’s not the least bit cheesy. There’s something else that’s magical about Facebook Gifts. Say your recipient doesn’t like your gift. You bought her a box of chocolates, and she’s allergic. Or maybe you purchased a jumper for her baby, but you chose the wrong size. Facebook Gifts allows her to adjust your gift to her preferences, and you remain none the wiser—she can choose the right size, a more appropriate color, or even swap your gift for something else entirely. Facebook shows her a menu of other gifts that are similarly priced, and she can pick anything she likes. And, finally, she’s the one who enters the address she’d like the gift shipped to. You, as the sender, don’t need to call your mom to ask for your Aunt Bertha’s ZIP code. At the moment there are two major problems with Facebook Gifts. First, there’s limited selection. In order to be truly useful, I’d need to be able to choose from items made by thousands of firms, not just a couple hundred. Linden concurred; he says expanding the number of available gifts is one of the team’s main priorities. If the Facebook Gifts team gets recommendations right, it will become a really wonderful thing. A few firms have already tried using social-networking data for recommending gifts; the best of these is Wal-Mart, whose recommendation app, called ShopyCat, combs through your friends’ Facebook profiles to figure out what they might like. But with all of the data that Facebook has on us, it’s natural to expect that the social network itself could come up with much better gift ideas. In a few years’ time, perhaps, shopping for the holidays may be something you can do in a half-hour’s time—click on each of your relatives, choose what Facebook tells you they’re sure to love, press Give, and get on with the rest of your day.